Our biggest challenge is to find potential life-bearing worlds among the stars. Discovering a planet that are not just Earth-sized, but truly Earth-like will mark a milestone in astronomy and beyond. Now, NASA’ engineers and scientists are working hard on their quest for what they call Earth 2.0. Astronomers use the Kepler Telescope, a space observatory designed to survey a small portion of our region of the Milky Way, to finding planets outside our solar system. To date, Kepler has found more than 1900 exoplanet and even twice candidates — about 3600. Finding these planets is not easy at all; They are too small comparable in size and brightness to their host stars; some stars are even million times brighter than their orbital planets. So, its a tricky job. To detect these faint worlds, Kepler use its only science instrument, a photometer that continually monitors the brightness of over 145,000 main sequence stars (star like our sun) in a fixed field of view. 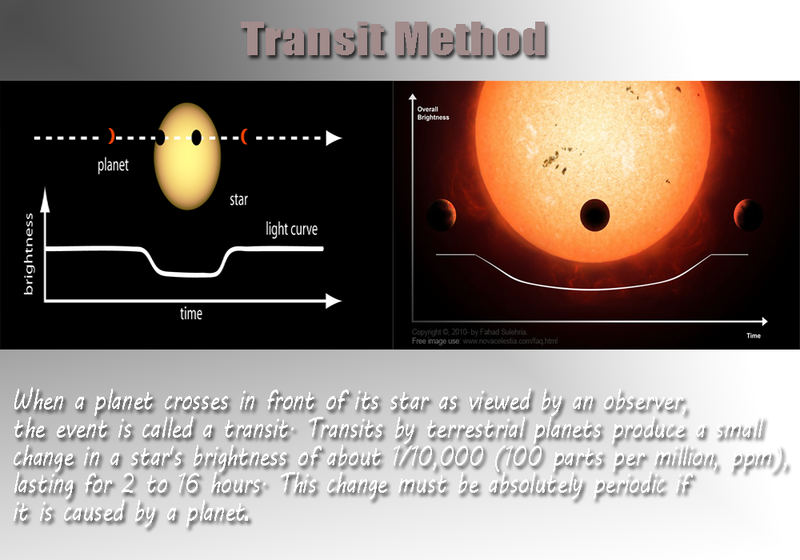 When a planet cross in front of its star, the star’s light dims by a small but detectable amount and thus Kepler detects these ‘drops’ and then transmit data direct-to-Earth to be analyzed by scientists — this method of detection is called the transit method, and most exoplanets have been discovered this way. In their quest for finding Earth 2, scientists are searching for planets orbiting stars like our sun. If a planet is located at the right distance, also called the habitable zone — not too far not too close to its host star, then liquid water might pool on the planet’s surface. But stars like our sun are rare in our galaxy comparable with other stars, like the dwarf M stars. Some studies show that just in our galaxy there are billions habitable planets like Earth, So, why can’t we find them? Maybe we are looking in the wrong place. New Abordation In a recent study, a team of astronomers announced a discovery of three potential habitable exoplanets orbiting one ultracool dwarf star just in our galactic backyard, 40 light-years away in the constellation of Aquarius. 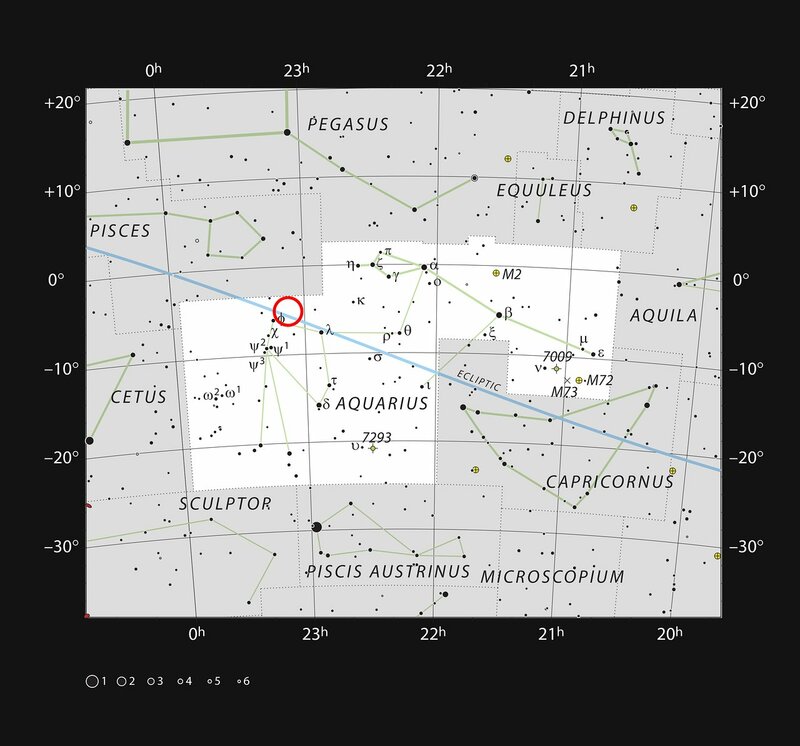 Location of TRAPPIST-1 in the constellation Aquarius ©ESO/IAU and Sky & Telescope. The star is dubbed 2MASS J23062928-0502285, but now known more conveniently as TRAPPIST-1, is a faint “ultracool” red dwarf star, located relatively close to our solar system, close enough to be considered part of Earth’s neighborhood. TRAPPIST-1 is much cooler and redder than our Sun, its .05% as bright as our Sun with a mass and radius of 8% and 11.5% those of the sol, respectively. Its surface’ temperature is only about 2,550 K — the Sun is literally more than twice as hot — so it’s informally called an “ultracool” star. The astronomers used 60-cm TRAPPIST telescope at ESO’s La Silla observatory in Chile to identify this amazing system. The planetary system is home to at least three planets, which are designated TRAPPIST-1b, c, and d, all of them are considered potential habitable due to their position to TRAPPIST-1. ultracool dwarf stars, such as TRAPPIST-1, are both very common in the Milky Way Galaxy and very long-lived, but this is the first time that planets have been found around one of them. said co-author Dr. Emmanuël Jehin. So far, the existence of such ‘red worlds’ orbiting ultra-cool dwarf stars was purely theoretical, but now we have not just one lonely planet around such a faint red star but a complete system of three planets. TRAPPIST-1b and TRAPPIST-1c have orbital periods of 1.51 days and 2.42 days, respectively, and the third planet, TRAPPIST-1d, has a less well determined period in the range 4.5 to 72.8-days. You may think that these planets are too close to their star, they are 20 times to 100 times closer to their star than Earth is to our sun, but considering that these star is just 11% as massive as the sun, it showers them with only a few times the amount of energy that Earth receives from our own sun. The exoplanets orbiting TRAPPIST-1 have sizes and temperatures similar to Earth, thus making the existence of liquid water on their surfaces very likely. said Julien de Witt, a scientist from the Liège team. Artist’ rendering of the view from the most distant exoplanet discovered around TRAPPIST-1 ©ESO/M. Kornmesser. Truly three Earth Like Planet? So are these planets truly Earth-like? We have no idea, we only estimated their surface temperature, position and mass. We don’t know much about them; they might be airless, or have thick atmospheres of carbon dioxide, or some other noxious combination, so don’t start looking into real estate on them just yet. commented Phil Plait ~ Bad Astronomy blogger. Maybe we will find out in the future. As new technologies are developed we will soon be able to study the atmospheric composition of these planets and search for signs of water as well as for traces of biological activity. The team’s research paper on their discovery was recently published by the European Southern Observatory team, in the Nature journal. Who’s to say that our solar system might actually be unusual in that it only has one planet that is so hospitable for life? Why the pessimism when we really have no way of knowing yet? It could very well be that plenty of other solar systems have multiple planets that are teeming with plant and animal life all over their lands and seas. The discovery of alien life in outer space in some solar systems may come very quickly because there’s another civilization on the very next planet in the system. We seem to have this pessimistic notion that life is rare, whereas I tend to think that it’s plentiful but we just haven’t seen it yet because we just fell out of the trees and stumbled out on the Savannah and have no clue how they’re communicating yet.